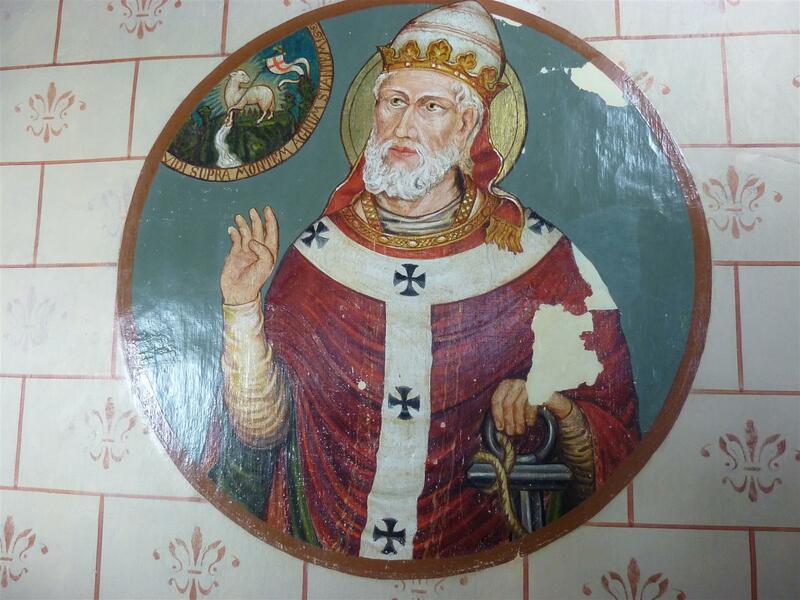 2.1 Here followeth the Life of S. Clement, Pope and Martyr, and first of his name. 2.1.1 Of S. Clement, Pope. Dom Romanus Jacobs, Paus Clemens in de Clemenskerk te Merkelbeek (1901), toen de restauratie nog niet helemaal klaar was. 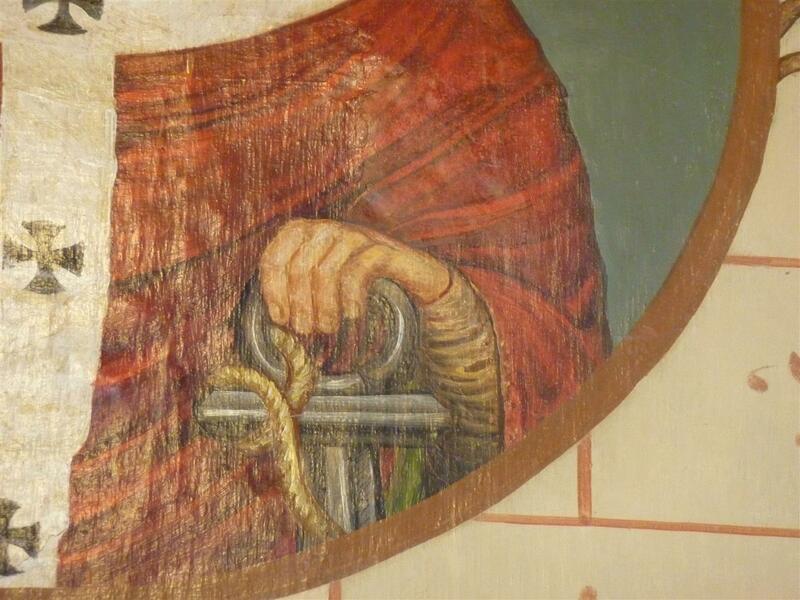 In zijn linkerhand toont hij zijn vaste attribuut, het anker uit de Legenda aurea. Ook het Lam Gods waar hij naar kijkt, berust op een passage uit de Legenda aurea. Foto Marij Coenen, april 2014. De kans is overigens groot dat een jongere generatie minder moeite zal hebben met het ‘realistische’ karakter van een heiligenverhaal als dat van Clemens. Wie opgegroeid is met Harry Potter, Lord of the Rings en Nardia is vertrouwd met goede en kwaadaardige tovenaars en de intriges die zich in het spanningsveld tussen licht en donker afspelen. De legende van Clemens, met schaduwrijke figuren als de magiër Simon Magus, de edelman Sisinnius, de provoost Mamertin en keizer Trajanus zelf, staat daar bol van. Ook al is de kerk daar allerminst van gecharmeerd, vanuit deze achtergrond kun je toch een zekere sympathie opvatten voor de visie van Simon Magus, die Petrus en zijn volgelingen (als Clemens) opvatte als magiërs van het kaliber van Gandalf en Perkamentus. Wie op deze manier de belevenissen van Clemens leest, zou wel eens tot zijn verrassing kunnen merken dat hij meer dan verwacht meegetrokken wordt in het verhaal. 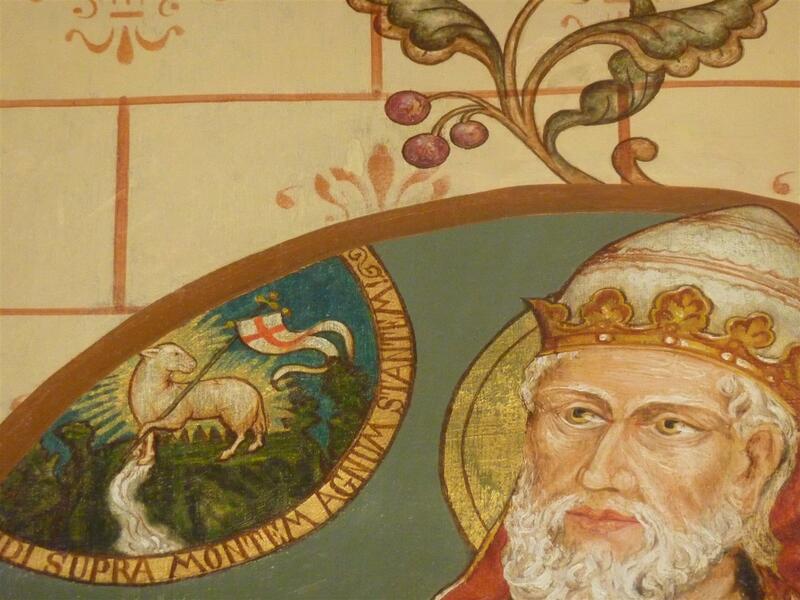 Here followeth the Life of S. Clement, Pope and Martyr, and first of his name. Clement is said of cleos, that is, glory, and mens, that is, mind, as it were a glorious mind. He had a glorious mind purged from all filth, ornate with all virtue, and decorate with all felicity. Or he is said of clementia, which is merciful. It is said in the glossary that clement is said righteous, sweet, ripe, and meek, righteous in deed, sweet in speech, ripe in conversation, and meek in intention. His life he himself set in his book named Itinerary, specially unto that place which he succeeded to S. Peter in the papacy. The remnant of his acts that commonly be had, be taken in divers places. Clement the bishop was born of the lineage of the Romans, and his father was named Faustinianus, and his mother Macidiana. He had two brethren, of whom that one was named Faustinus and that other Faustus, and Macidiana was of marvellous beauty. Her husband’s brother burned in the love of her by the disordinate concupiscence of luxury, and daily he vexed her in desiring her to accord to his foul lust, but she in no wise would consent to him. And she doubted to show it to her husband because there should no debate ne enmity fall between the brethren. Then she thought to absent her by some means from him so long that he should forget this disordinate love, for the sight of her presence set him afire. And because she might have licence of her husband, she feigned a dream subtly, which she told to her husband in this wise, saying: There is a vision come to me this night by which I am commanded to depart out of this city of Rome with my two sons Faustinus and Faustus, and that I should abide out so long till I were commanded to return, and if I did not I should die and my children also. And when her husband heard this he was sore abashed and afeared, and sent his wife and his two sons to Athens with much other meiny, and that she should abide there and set her sons to school, and the father held Clement at home with him, which was the least, and was but five years old, for his solace. And as the mother sailed on the sea with her sons, there rose a great tempest and brought the ship to wrack and was all to-broken, and the mother was thrown by the waves of the sea upon a rock and escaped, weeping that her two sons had been perished, and for sorrow and discomfort would have drowned herself in the sea if she had not had hope to find her sons. And when she saw that she could not find them alive ne dead, she cried and brayed strongly, and bit her hands, and would not be comforted of nobody, and then came to her many women, which told to her the fortunes that they had had, but she was comforted by none. And among the other there came one that said she had lost her husband, a young man, in the sea, and that she would never after be married for the love of him, and she comforted her how it was, and dwelled with her, and gat daily their living with their hands. But anon after, her hands that she had bitten, became so sore and broken out, that she might not work, and she that harboured her had the palsy and might not rise out of her bed. And thus was Macidiana constrained to beg and ask her living from door to door, and of such as she could get she fed herself and her hostess. And when the year was passed that she was departed with her children, her husband sent messengers to Athens for to know how they did, but them that he sent returned not, and he sent other messengers after, which returned and said that they had found none. And then he left Clement his son under the keeping of certain tutors, and went for to seek his wife and his children, and took his shipping, but he came not again. And thus Clement was twenty years orphan, and never had tidings of father ne mother, ne of his brothers, and he went to study and became a sovereign philosopher, and desired and enquired diligently in what manner he might know the immortality of the soul, and therefore haunted he oft the schools of philosophy; and when he heard that it was concluded in the disputation that the soul was immortal, he was glad and joyous; and when they said that it was mortal he went all heavy and confused. And at the last when Barnabas came to Rome preaching the faith of Jesu Christ, the philosophers mocked him as he had been mad or out of his wits, and, as some say, Clement was the first philosopher that mocked him and despised his predication, and in scorn put to him this question, saying: What is the cause that culex, which is a little beast, hath six feet and two wings, and an elephant which is a great beast hath but four feet and no wings? To whom Barnabas said: Fool, I might lightly answer to thy question if thou demandedst it to know the truth, but it should be a rude and a deaf thing to say to you anything of creatures, when ye know not the maker of the creatures, and because ye know not the creator of all, it is right that ye err in the creatures. This word went much to the heart of Clement the philosopher, in such wise that he was informed of Barnabas in the faith of Jesu Christ, and went anon into Judea to S. Peter, which taught him the faith, and showed to him the immortality of the soul all clearly. And in that time Simon the enchanter had two disciples, that is to wit Aquila and Nicetas, and when they understood and knew his fallacies they forsook and left him and fled to S. Peter and were his disciples. Then S. Peter demanded of Clement of what lineage he was, and he told to him all by order what was happed to his father, and to his mother, and to his brethren, and said that he supposed that his mother with his brethren was drowned in the sea and that his father was dead for sorrow or drowned also in the sea. And when S. Peter heard this he might not keep him from weeping. On a time Peter came into the isle where Macidiana, the mother of Clement dwelled, in which isle were pillars of glass of marvellous length, and as S. Peter beheld these pillars he saw Macidiana begging, whom he blamed because she laboured not with her hands, and she answered and said: Sir, I have nothing but the form and likeness of my hands, for they be so feebled by my biting that I feel them not, and me repenteth that I drowned not myself in the sea that I should no longer have lived. Then Peter said: What sayst thou, woman? Knowest thou not that the the souls of them that slay themselves be most grievously punished? To whom she said: Would God that I were certain that souls should live after the death, for then would I slay myself to the end that I might but one hour see my sweet children. And when Peter had demanded of her the cause, and that she had told to him all the order of the things done, then Peter said: There is a young man with us named Clement which saith like as thou sayest, that it so happed to his father and mother and to his brethren. And when she heard that, she was smitten with so great wonder that she fell, and when she was come to herself, she said weeping to S. Peter: I am certainly mother of that young man, and kneeling down tofore S. Peter, she prayed him that he would hastily show to her her son, and Peter said to her: Abide a while till we be out of this isle, and when they were out of the isle, Peter took her by the hand and brought her to the ship where Clement was in. And when Clement saw Peter holding the woman by the hand he began to laugh; and anon as this woman was nigh by Clement she might abstain her no longer, but embraced him about the neck and kissed him. And he put her aback like as she had been frantic, and was much angry against Peter. And Peter said to him: Whatsomever thou doest, put thou not away thy mother. And when Clement heard that, anon he began to weep, and advised him, and took up his mother which was fallen down aswoon and began to know her. And the hostess that lay sick of the palsy was brought forth by the commandment of Peter, and he healed her anon. And then the mother demanded Clement of his father, and he said to her that he went to seek her, and that he sith never saw him, and when she heard that, she sighed and comforted her other sorrows by the great joy that she had of her son. In the meanwhile Nicetas and Aquila came, which were not there when she came, and when they saw this woman they enquired what she was. Then Clement said: She is my mother whom God hath given to me by my lord Peter. Then Peter told to them all by order, and when Nicetas and Aquila heard that, they arose and were all abashed and said: Lord, maker of all things, is this true that we have heard, or is it a dream? Then Peter said to them: If ye be not out of your mind these things be all true. Then said they: We be Faustus and Faustinian, whom our mother had supposed had been perished in the sea. And then the mother ran and embraced them about the neck and said: What may this be? And Peter said: These be thy sons, Faustus and Faustinian, whom thou supposedst had been perished in the sea. And when she heard that, she fell down aswoon for joy. And when she was come again to herself, she said to them: Say ye to me how ye escaped. And they said: When our ship was broken we were borne upon a table, and other mariners found us and took us into their ship, and changed our names, and sold us to a woman named Justine which hath holden us as her sons, and hath made us to learn the arts liberal, and after, we learned philosophy and sith we joined us unto Simon, an enchanter, which hath been nourished with us, and when we knew his fallacies, we left him all, and were made disciples of Peter. And the next day following, Peter, with his three disciples, Clement, Nicetas, and Aquila went into a more secret place for to pray, and a much ancient and honourable man, but right poor, was there, and began to reason and say to them: I have pity on you, brethren, for under the likeness of pity I consider you greatly to err. For there is no God ne none worshipping here, ne no providence in the world, but fortune only, of engendrure and hap, doth all, like as I have found expertly of myself, which was informed in the discipline of mathesis more than many others. Then pray ye no more, for whether ye pray or pray not, that which is ordained to you by destiny shall fall. And Clement beheld him, and his heart judged that he had seen him tofore time, and when Clement, Aquila, and Nicetas had long disputed with him by the commandment of Peter, and they had showed to him what providence was, by open reasons, and for reverence called him often father, Aquila said: What need have we to call him father when we have in commandment that we ought to call no man father upon earth? And he beheld this ancient man and said: Thou holdest thee injured father, because I blamed my brother that called thee father. We have in commandment that we should call no man by such name, and when he had said so, all they of the company laughed, and he asked them why they laughed, and Clement said: Thou dost that for which thou blamest others in calling this old man father. And when they had enough disputed of providence, the old man said: I had well believed providence, but mine own conscience denieth me it, that I may not believe it. I know my destiny and my wife’s, and that which fortune hath destined is ordained to each body. Now hearken ye what fortune happed to my wife. She had in her nativity, Mars with Venus upon the centre, and the moon waning in the house of Mars and ends of Saturn. And this adventure maketh the adulterers to break their wedlock, and to love their servants, and to go with them into strange countries, and to be drowned in waters, and so is it fallen by my wife. For she fell in the love of her servant and fled with him and perished in the sea, for as my brother hath recounted to me, she loved him first, and he would not consent to her, and then she turned her lecherous love in her servant, and it ought not to be laid any blame in her, for her destiny hath made her to do so. And then he told how she feigned a dream, and how in sailing towards Athens she perished. And then his sons would have run to him and have discovered the matter. But Peter defended them and said: Suffer ye till it please me; and then Peter said to him: If I show to thee this day thy wife, right chaste, with thy three sons, wilt thou believe that destiny is nothing ? And he said: Like as it is a thing impossible to show that thou hast promised, so impossible is it to do anything above destiny. And then said Peter: This is Clement thy son, and these two be thy two sons, Faustus and Faustinian. Then the old man fell down for joy as he had been without soul. Then his sons came unto him and kissed him, and were afeard that he should not have come to himself again, and when his swooning was gone, he heard of them all by order, how all things had happened. Then his wife came suddenly and began to cry and weep strongly, saying; O my husband and my lord, where is he? And this said she as she had been all from herself, and the old man, that hearing, ran to her and embraced her straining with great weeping, and then as they thus were dwelling together, there came a messenger that told how Apion and Ambion, which were great friends unto this old man Faustinian, were lodged with Simon Magus, of whom this old man was much glad, and went to visit them. And forthwith came a messenger which said that there was come a minister of the emperor’s unto Antioch, and sought all the enchanters for to punish them to death. Then Simon Magus, because he hated the sons of Faustinian, because they forsook him, he imprinted his similitude and likeness in this old man Faustinian, in such wise that of every man he was supposed to be Simon Magus. And this did Simon Magus because he should be taken of the ministers of the emperor, and be slain instead of him, and Simon then departed from those parts. And when this old Faustinian came again to S. Peter and to his sons, the sons were abashed, which saw in him the similitude and likeness of Simon Magus, and understood the voice of their father, but S. Peter saw the natural likeness of him. And his wife and his sons blamed and reproved him, and he said: Wherefore blame ye me and flee from me that am your father ? 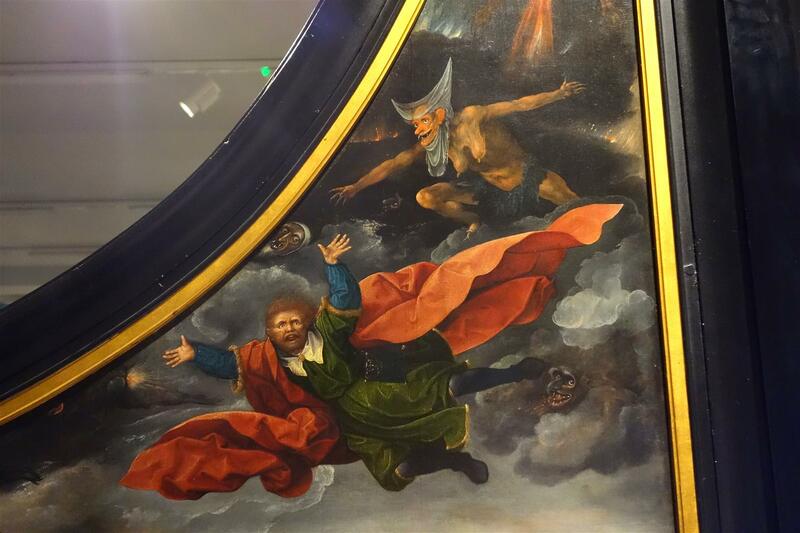 And they said: We flee from thee because the likeness of Simon Magus appeareth in thee. Now this Simon had composed an ointment and anointed him withal, and had imprinted the form of himself by art magic in this old man, which wept and said: What mishap, alas, is fallen to me! I have but one day been known of my wife and of my children, and may not be joyful with them. And his wife and his children wept sore, and tore their hair. And Simon Magus when he was in Antioch defamed strongly S. Peter, and said he was a cursed enchanter and a homicide, and had so moved the people against Peter that they purposed so slay him if they might once hold him. And then said S. Peter to this old Faustinian: Because thou art like and seemest Simon Magus, go forth into Antioch and excuse me tofore all the people of such things as Simon himself hath said of me, and after I shall come into Antioch and shall take from thee this strange likeness, and shall give to thee again thy proper and natural similitude tofore all the people. But it is not to suppose that S. Peter bade him to lie, for God hath no need of leasings. And then should the book of Clement, called Itinerarium, not be apocryphum, as who saith, of none authority, in which these things be written, and ought not to be taken in such things, but as it pleaseth to some men. Nevertheless it may be said, if these words be diligently considered, that he should not say that he were Simon Magus, but that he should show to the people the semblance of Simon Magus’ visage, showing S. Peter in the person of Simon, and should revoke the words that he had said, and if he said that he was Simon, that was not as touching the truth, but unto the appearance and likeness. Then Faustinian said: I am Simon, as who saith, I am like unto Simon, and was supposed to be Simon of the people. Then this old man, Faustinian, went into Antioch, and assembled the people and said: I Simon show to you and confess that I have deccived you of all that I have said of Peter the apostle, for he is no traitor ne enchanter, but is sent for the health of the world. Wherefore if ever I hereafter shall say anything against him, that ye take me as a traitor and wicked, and put me away from you, for I do now penance for that I acknowledge me to have said falsely and evil of him. I warn you therefore that ye believe in him that ye ne your city perish not. And when he had said this that Peter had commanded him, and had stirred the people into love of Peter, S. Peter came to him and made his prayer, and after took away from him the likeness of Simon, and became in his natural likeness. Then all the people of Antioch received debonairly S. Peter, and with great honour enhanced him and set him in a chair as a bishop. And when Simon Magus heard this he came and gathered the people together and said: I marvel when I have enseigned and taught you the commandments of health, and have warned you that ye should keep you from the traitor Peter, and ye have not only heard him but ye have enhanced him, and have set him in the chair of a bishop. Then all the people arose in a great fury against him and said: Thou art nothing but a monster, thou saidest that other day that thou repentedst of that thou hadst said against S. Peter, and now thou wouldst overthrow us and thyself. And all at once they rose against him and cast him out of the town. All these things S. Clement telleth of himself in his book, and hath set it in this history. 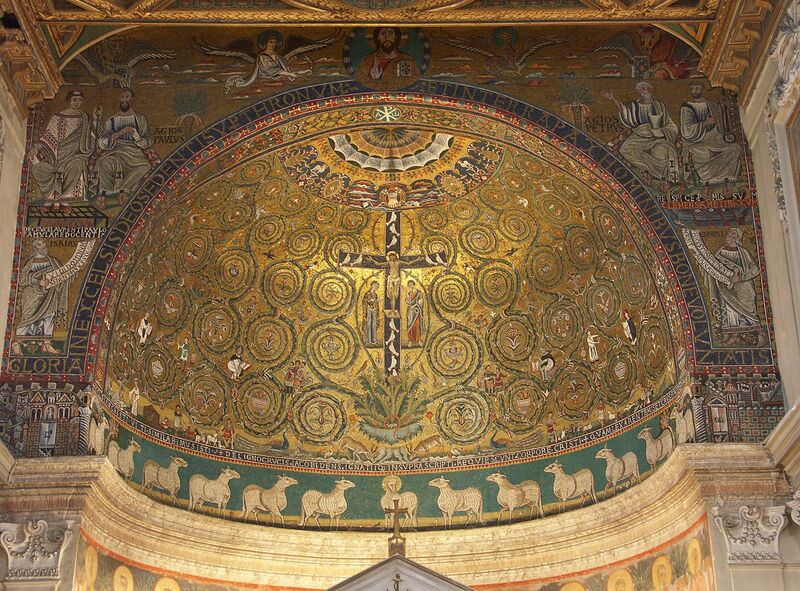 After this when S. Peter came to Rome and saw that his passion approached, he ordained Clement to be bishop after him. 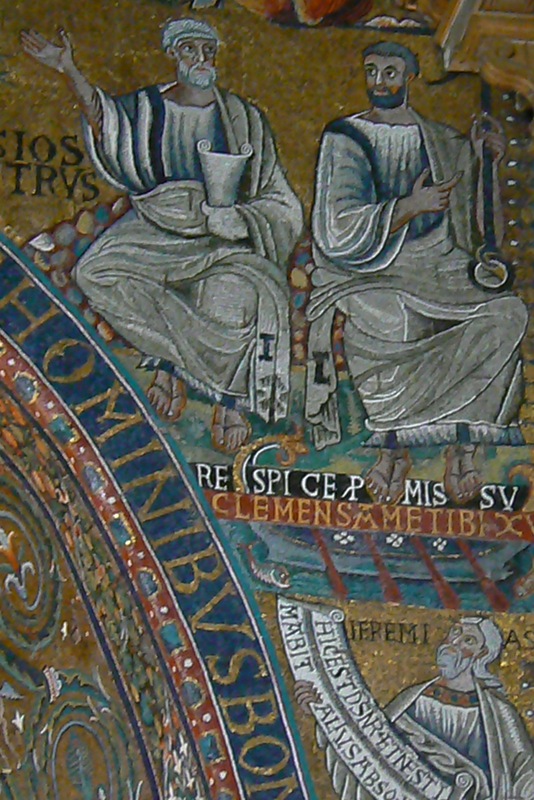 And when S. Peter, prince of the apostles, was dead, Clement, which was a man purveyed, and took heed of the time to come, so that lest by his ensample every bishop would choose a successor after him in the church of our Lord, and so possess the see of God by heritage, he gave it over to Linus and afterwards to Cletus, and after them Clement was chosen and compelled to take it upon him, wherein he shone by virtuous liviing and good manners that he pleased well unto the Jews, christian men and paynims. He had the poor people written by name of every each religion for to give to them according to their necessity, he loved much poor people, and them that he sanctified by baptism he suffered them not to beg commonly. 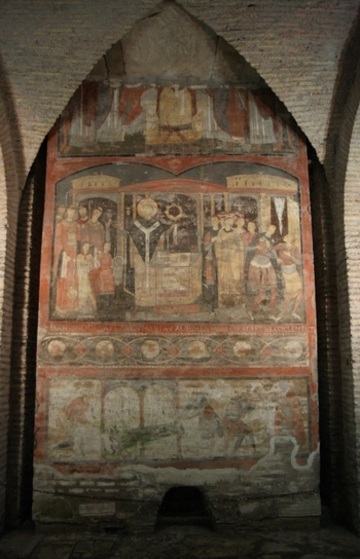 Een bijzonder fresco in de San Clemente te Rome betreft de geschiedenis van Clemens en Sissinius. Links zie je een interpretatie in volle kleuren van de feitelijke situatie rechts. In het middentafereel wordt de scène beschreven waarbij Sissinius zijn vrouw bespiedt ‘die christelijke erediensten bijwoont. Tot straf maakt God hem blind en doof. St. Clemens geneest hem, maar de ondankbare Sisinnius wil hem en zijn gezellen gevangen nemen. God verandert dezen in zuilen, maar de wachters proberen de zuilen mee te nemen. Sisinnius roept: Trekken, hoerenzonen. Trekken, Gosmari en Albertel. Jij, Carvoncelle, zet er een hefboom achter!’* Dit tafereel met de bijbehorende teksten vind je in het onderste muurveld. Herkomst afbeelding links: Heiligen.net. Herkomst afbeelding rechts: Sacred Destinations. And when he had sacred a damoisel with a veil which was a virgin, and niece of Domitian the emperor, and had converted to the faith Theodora, wife of Sisinnius, friend of the emperor, and she had promised to be in purpose of chastity, Sisinnius had doubt of his wife, and entered after her into the church privily for to know what she used to do there; and when S. Clement had said the orison and the people had answered, Amen, Sisinnius was made deaf and blind and he said to his servants: Bring me hence and lead me out, and they led him round about the church and could not come to the doors ne gates. And when Theodora saw them erring so, she went to the first door, weening that her husband had known her, and after, she asked of the servants what they did, and they said to her: Our master would hear and see that was not lawful, and therefore he is made both blind and deaf. And then she gave herself to prayer, and prayed God that her husband might go out from thence, and after her prayers she said to the servants: Go ye hence and bring my lord home to his house, and they went and brought him thither. And Theodora went unto S. Clement and told to him what was happened, and then this holy man came to him and found his eyes open, but he saw ne heard nothing. Then S. Clement prayed for him, and anon he received his sight and his hearing, and when he saw Clement standing by his wife, he was wood, and supposed that he had been illuded by art magic, and commanded his servants to hold fast Clement, saying: He hath made me blind by art magic for to come to my wife; and he commanded to his ministers that they should bind Clement and so draw him, and they bound the pillars and stones, weening to Sisinnius, that they had bound S. Clement and his clerks and drawn them forth. Then Clement said to Sisinnius: Because thou worshippest stones for gods and trees, therefore hast thou deserved to draw stones and trees. And he which supposed him to be bound verily, said: I shall do slay thee. And then Clement departed, and he prayed Theodora that she should not cease to pray till that our Lord had visited her husband. Then S. Peter appeared to Theodora praying, and said to her: Thy husband shall be saved by thee for to accomplish that that Paul my brother saith: The man miscreant shall be saved by his true wife. And this saying, he vanished away; and anon Sisinnius called his wife to him and prayed her to pray for him, and that she should call to him S. Clement. And when he was come he was instructed in the faith, and was baptized with three hundred and thirteen of his meiny, and many noble men and friends of the emperor believed in our Lord by this Sisinnius. Then the earl of the sacrifices gave much money, and moved great treason and discord against S. Clement. Then Mamertin, provost of the city of Rome might not suffer this discord, but made S. Clement to be brought tofore him, and as he reproved and essayed to draw him to his law, Clement said to him: I would well rather that thou wouldst come to reason. For if many dogs have barked against us and have bitten us, yet they may not take from us but that we be men reasonable, and they be hounds disreasonable. This dissension which is moved, it showeth that it hath no certainty ne truth. And then Mamertin wrote unto Trajan the emperor, of Clement, and he had answer that he should do sacrifice or to be exiled into the desert that was beyond the city over the sea. Then the provost said to him weeping: Thy God whom thou worshippest purely, may he help thee. Then the provost delivered to him a ship and all things necessary to him, and many clerks and lay people followed him in exile. And the provost found in that isle more than two thousand people christian, which had been long there condemned for to hew the marble in the rocks. And anon when they saw S. Clement they began to weep, and he comforted them and said: Our Lord hath not sent me hither by my merits, but he hath made me partner of your crown. And when he understood of them that they fetched water six miles thence, and bare it upon their shoulders, he said to them: Let us all pray unto our Lord that he open to us, his confessors in this place here, the veins of a fountain or of a well, and that he that smote the stone in desert of Sinai and water flowed abundantly, he give to us running water so that we may be enjoyed of his benefits. And when he had made his prayer, he looked here and there, and saw a lamb standing which lifted up his right foot and showed a place to the bishop, and he understanding that it was our Lord Jesu Christ, whom he only saw, went to the place and said: In the name of the Father and of the Son and of the Holy Ghost, smite in this place. And when he saw that no man would smite in the place where the lamb stood, he took a little pickaxe, and smote one stroke lightly in the place under the foot of the lamb, and anon a well or a fountain sprang up and grew into a great flood. Then, unto all them joying, S. Clement said: The coming of the flood gladdeth the city of God. And for the fame of this miracle much people came thither, and five hundred and more received baptism of him in one day, and they destroyed the temples of the idols through all that province, and within one year they edified seventy-five churches to the honour of our Lord. And three years after, Trajan the emperor, understanding this which was the year of our Lord one hundred and six, sent thither a duke, and when this duke saw that all they would gladly die for God’s love, he left the multitude and took only Clement, and bound an anchor round his neck and threw him into the sea, and said: Now they may not worship him for a god. And all that great multitude of the people went to the rivage of the sea and beheld the cruelty of the tyrant. And then Cornelius and Phoebus, disciples of S. Clement, commanded to all the others to pray to our Lord that he would show to them the body of his martyr; and anon the sea departed three miles away far, so that all they might go dry foot thither, and there they found a habitacle in a temple of marble which God had made and ordained, and found the body of S. Clement laid in an ark or a chest, and the anchor thereby, and it was showed to his disciples that they should not take away the body from thence. Every year, in the time of his passion, the sea departed by seven days during, four miles far, which gave dry way to them that came thither. In one of the solemnities there was a woman went thither with a little child, and when the solemnity of the feast was accomplished, the child slept, and the noise and sound of the water was heard which came and approached fast, and the woman was abashed and forgat her child, and fled unto the rivage with the great multitude of people, and afterwards she remembered her son and began strongly to cry and weep, and ran hither and thither braying by the rivage for to know if by adventure the body of her son might be cast up on the rivage; and when she saw no succour ne no hope, she returned home, and was all that year in weeping and in heaviness. And the year after following, when the sea was departed and the way open, she ran tofore all the others and came to the place for to know if by adventure she might have any knowledge or find anything of her son, and when she kneeled down tofore the tomb of S. Clement and had made her prayers, she arose up and saw her son in the place where she had left him sleeping. Then she supposed he had been dead, and went near for to have taken the body as it had been without life, but when she saw him sleeping, she awoke him and took him in her arms tofore all the people all whole and safe, and enquired of him where he had been all that year. And he said that he wist not, but that he had slept there but one night sweetly. S. Ambrose saith in his preface in this wise: When the most wicked persecutor was constrained of the devil for to torment by pains the blessed Clement, he gave to him no pain, but victory. The martyr was cast into the flood for to be drowned, and therefore came he to a good reward by which Peter his master came into heaven. Christ approving the minds of them both in the floods, he called Clement from the bottom of the sea to the palm of victory, and he releved S. Peter in the same element, that he should not be drowned, unto the heavenly realm. Leo, the bishop of Ostia, recounteth that in the time that Michael the emperor governed the Empire of Rome, a priest, named Philosophus, came to Tersona and demanded of them that dwelled in the country of the things that be rehearsed in the history of S. Clement, and because they had not been of that time, but were strange, they said that they knew nothing thereof. For, for the sin of them of the country that dwelled in that place, the water had long ceased for to withdraw as it was wont to do. In the time of Martin the emperor the church had been destroyed of the barbarians, and the ark with the body of the martyr was wrapped in the floods of the sea for the sin of them that dwelled there, and then the priest was all amarvelled of these things and came unto a little city named Georgia, and went with the bishop and the clerks with the people for to seek the holy relics in the isle whereas they supposed that the body of the holy martyr had been. And there they digged and sang hymns and canticles, and then by revelation divine they found the body of the holy saint and the anchor by it which was cast into the sea with him, and then they bare it to Tersona. 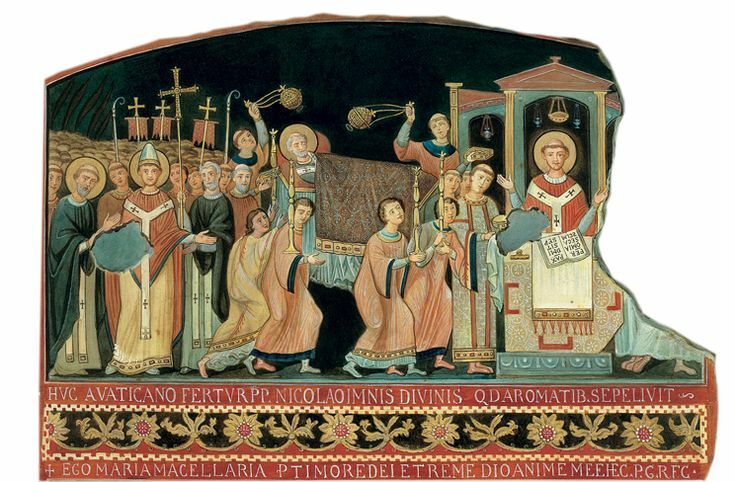 And after, this same priest came to Rome with the body of S. Clement, and there showed God many miracles for this holy saint, and the body was laid in the church, which is now called S. Clement. And it is read in a chronicle that the sea waxed dry in that place, and that the blessed Cyril, bishop of Morianne, brought the holy body unto Rome. Then let us devoutly pray unto this blessed saint, S. Clement, that by his merits we may deserve to come to the bliss of heaven. Amen. Voor de volledige titels van literatuur die hier verkort worden weergegeven zie de bibliografie van de Clemenskerk op deze site. De volledige tekst van Caxtons editie van de Legenda aurea is te vinden via: http://bit.ly/Legenda-aurea. Voor het hoofdstuk daarin over Clemens, dat hierboven is overgenomen, surf naar dit item. Op de eerste twee na zijn de ingelaste kopjes van mijn hand, te weten: 2.1.2 tot en met 2.1.8 (zie inhoudsopgave boven aan de pagina). Voor de gebruikte edities van de Legenda aurea en de vertaalde passages uit de legende van Clemens, zie Hubar, Verhalen op de muur, pp. 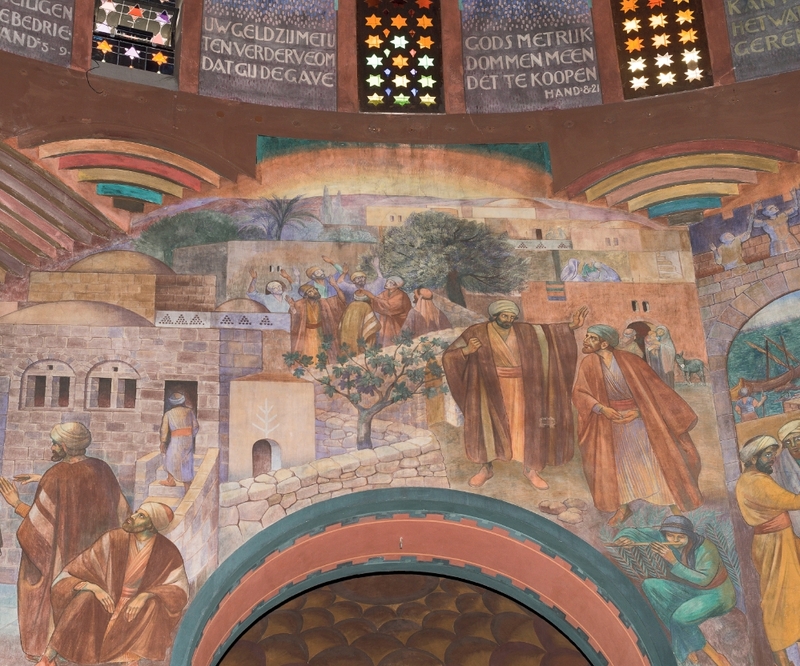 101-103; 106-107: http://bit.ly/Clemenskerk-inkijkexemplaar. 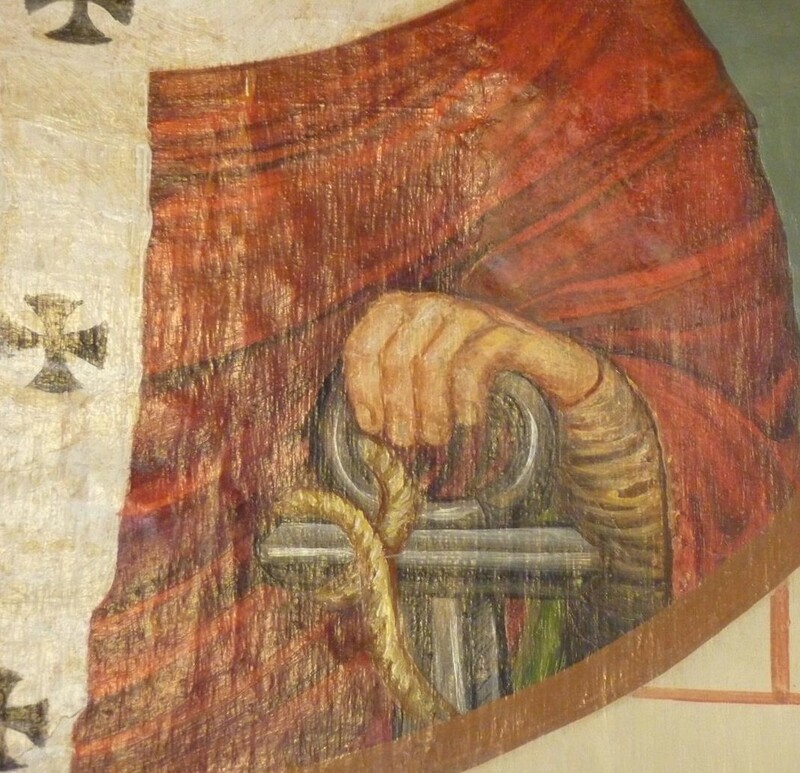 De foto’s van het apsismozaïek van de San Clemente te Rome zijn van de hand van Dnalor: “Rom, Basilika San Clemente, Apsis 1” by Dnalor 01 – Eigen werk. Licensed under Creative Commons Attribution-Share Alike 3.0 via Wikimedia Commons. Voor Simon Magus zie het item op Wikipedia: http://nl.wikipedia.org/wiki/Simon_Magus. De afbeelding van de val van Simon Magus is ontleend aan Wikimedia: The Fall of Simon Magus (left) and The Conversion of St. Paul (right), by Jan Rombouts, c. 1522-1530, view 6 – Museum M – Leuven, Belgium – DSC05051” door Daderot – Eigen werk. Licentie CC0 via Wikimedia Commons. 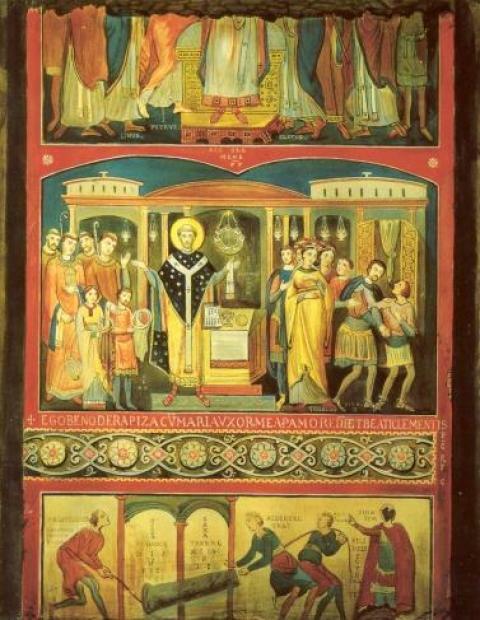 Het citaat in het onderschrift van het fresco over Clemens, Theodora en Sisinnius is afkomstig uit de PDF over de San Clemente van Garmt Bouwman. Voor de vergelijking van het waterwonder van Clemens met dat van Benedictus en Mozes, zie Hubar, Verhalen op de muur, pp. 102-106 : http://bit.ly/Clemenskerk-inkijkexemplaar. De miniatuur ontleend aan de site Patristique.org heeft als verwijzing: © Bnf. Ms. Français 241, fol. 311. Wie meer wil weten over de Legende aurea kan terecht bij Victor Hunink die samen met Mark Nieuwenhuis in 2006 de mooiste heiligenlevens heeft vertaald (zie de bibliografie op deze site, met een link om het boek te downloaden). Voor de muurschildering van Piet Gerrits in de Cenakelkerk van de Heilig Landstichting zie Hubar, De genade van de steiger, pp. 246-251. De foto van de beeldbank van de RCE is gemaakt door Sjaan van der Jagt van Pixelpolder.